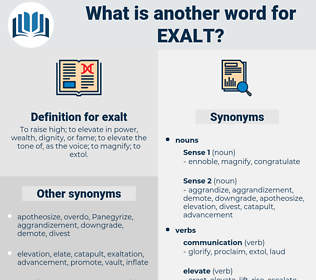 What is another word for exalt? To raise high; to elevate in power, wealth, dignity, or fame; to elevate the tone of, as the voice; to magnify; to extol. blows up out of proportion. degrade, halt, damn, disapprove, raze, stop, deny, disgrace, debase, depress, denounce, humiliate, shame, dishonor, lower, condemn, disrespect, refuse, decrease. demean, detract, reprove, criticize, censure, reprimand, rebuke, lambaste, reproach, reprobate, chide, admonish, castigate, blame, minimize. If this community is dedicated to righteousness, then let us exalt the standard. And joy shall exalt their pride to be The same in birth if in soul the same. 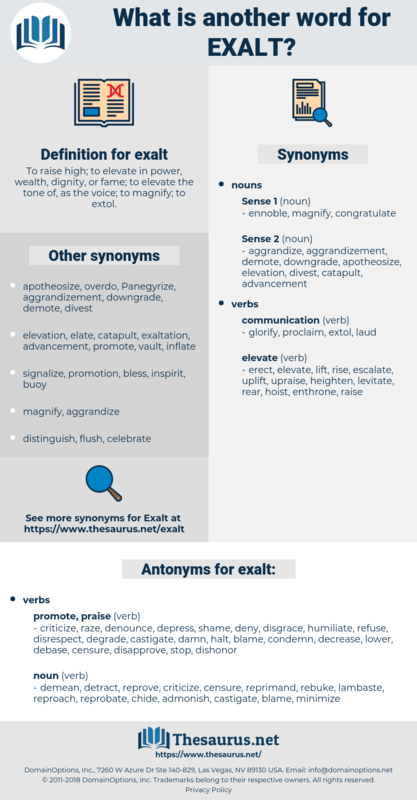 eclat, exocycloida, eschalot, equal to, escalate, exult, Egality, egalite, eaglet, escalade, eskalith, exalted, ejaculate, exclude, equality, excel at, euclid, eagle-eyed. crack up, hymn, canonise, ensky, canonize.